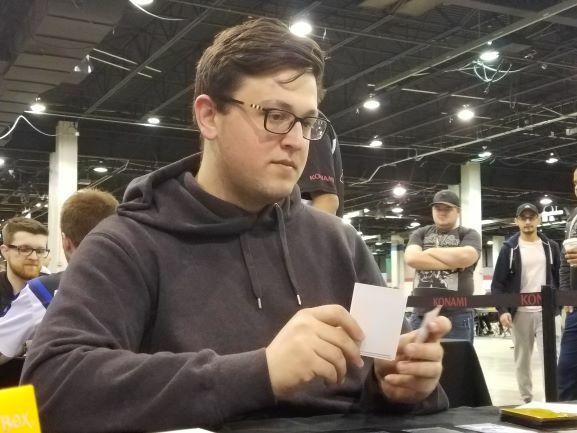 Welcome to the final round of Swiss at YCS Chicago! 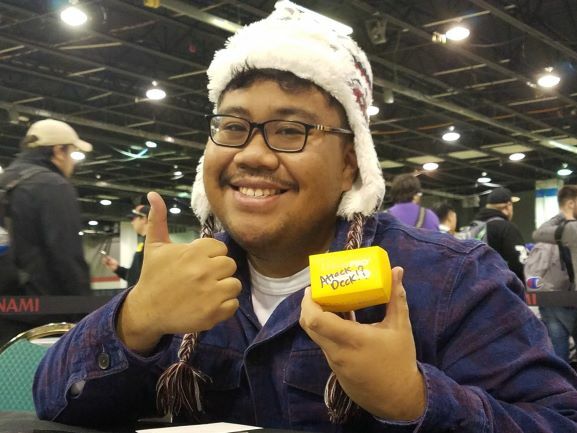 Duelist Ed Acepcion, from Carson, CA, is with us for this Feature Match, playing what he calls his “Attack Deck”. It’s a Danger! strategy packing Orcust, Kaiju, and Sekka’s Light, to name a few things. He calls it the Attack Deck because he claims to have not had a Main Phase 2 all tournament – it’s over once he gets to the Battle Phase. He’s only lost one time, in Round 10, so the Deck seems to be working so far! 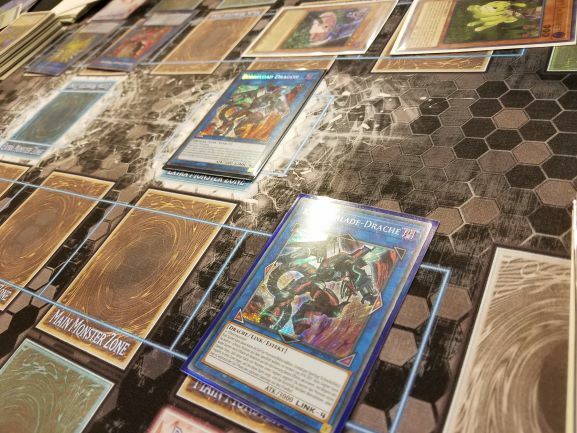 He wanted a Feature Match not only to show off his Deck, but also because his coworkers didn’t believe he was taking the weekend off to Duel – hello to Ed’s friends at work! His opponent is Aaron Furman, from New Jersey. He’s a UDS Champion and a YCS Champion with an amazing Dueling record and no stranger to the Feature Match table. He’s using a Danger! Thunder Dragon strategy which utilizes the new Guardragon Xyz Monsters! Acepcion won the die roll and chose to play second. Furman began with Batteryman Solar, sending Thunder Dragonroar to the Graveyard. He activated Danger! Nessie!, discarding Danger!? Jackalope?. Nessie hit the field and Furman drew a card, then Jackalope Special Summoned Danger! Mothman!. He used both Danger! monsters to play Reprodocus, then banished three DARK monsters, including Dragonroar, to play Chaos Dragon Levianeer! Acepcion lost Fantastical Dragon Phantazmay from his hand. The banished Dragonroar Special Summoned Thunder Dragondark, and Solar created a Batteryman Token. He used Solar, Levianeer, the Token, and Dragondark to play Saryuja Skull Dread. Dragondark added a Thunder Dragonhawk to Furman’s hand, and Saryuja let Furman draw four cards and return three to his Deck. He played Sekka’s Light to draw two cards, then had Saryuja Special Summon a Solar, and Dragonhawk Special Summoned Dragonroar. He used Reprodocus to make Saryuja a Dinosaur, and used both to play Summon Sorceress. He Special Summoned White Dragon Wyverburster, then had Summon Sorceress bring Eclipse Wyvern into play. He used Wyverbuster to play Guardragon Elpy, and Wyverbuster added Black Dragon Collapserpent to Furman’s hand. He used Eclipse and Summon Sorceress to play another Saryuja Skull Dread, and Eclipse banished a Chaos Dragon Levianeer. Elpy Special Summoned Darkest Diabolos, Lord of the Lair, then he Special Summoned Collapserpent as well, banishing Eclipse and getting Levianeer to his hand. He used Diabolos and Collapserpent to play Guardragon Agarpain, and Collapserpent searched out a Wyverbuster. Agarpain Special Summoned Red Hot Dragon Archfiend Abyss, then he used Solar, Elpy, and Agarpain to play Borreload Dragon. He used Dragonroar to play Thunder Dragon Colossus, then Special Summoned Diabolos with its effect. He activated Danger!? Tsuchinoko? in his hand, discarding Wyverbuster to Special Summon the Tsuchinoko. He used the effect of Thunder Dragon to add two more to his hand. He used Sekka’s Light to shuffle away a Thunder Dragon and get a new card. He then played Levianeer, using it and Diabolos to play Number 22: Zombiestein. Acepcion had Danger!? Tsuchinoko?, Jackalope, Denko Sekka, and Destrudo the Lost Dragon’s Frisson. He drew Radian, the Multidimensional Kaiju. Radian was used to Tribute Hot Red Dragon Archfiend Abyss, then he used Tsuchinoko. It discarded Jackalope. He Special Summoned Tsuchinoko and Nessie with their effects, and drew a Nessie. He used Nessie in a risky play, but discarded it and was unable to search due to Colossus! He Special Summoned Destrudo and used it with Tsuchinoko to play Yazi, Evil of the Yang Zing, using its effect to destroy Zombiestein and Special Summon Mare Mare. He had it create a Token, which let him play Linkuriboh, then made another Token and combined it with Linkuriboh for Knightmare Phoenix. Another Mare Mare Token come out, and he Tributed it to bring back Linkuriboh, using that with Phoenix to play his own Borreload Dragon. It attacked Furman’s Borreload, stealing it, and that one attacked and stole Saryuja. Saryuja attacked Radian, with both Borreload effects weakening Radian. Acepcion lamented the fact that he had to go into Main Phase 2 for the first time, as he was unable to finish Furman off that turn. Furman discarded his Thunder Dragon to get a new copy in his hand. He played Phantom Skyblaster and created two Skyblaster Tokens. He activated Nessie in his hand, discarding Dragondark and Special Summoning the Nessie. He Nessie and both Tokens to play Link Spider and Knightmare Phoenix. 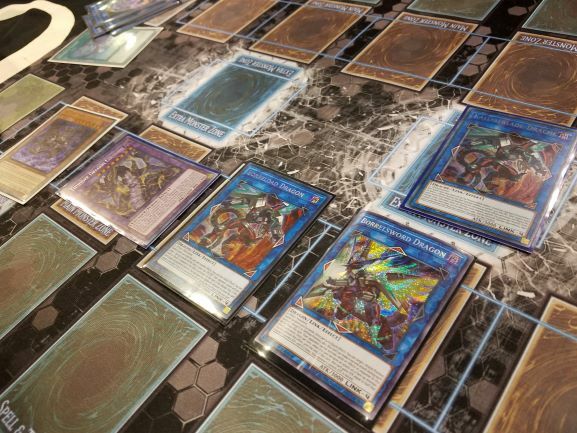 Colossus, Link Spider, and Phantom Skyblaster were used to play Knightmare Unicorn, which shuffled Acepcion’s Nessie into the Deck and let Furman draw a card. With his Borreload stolen, Furman needed an answer to Acepcion’s Borreload and began fishing for draws. Furman used Jackalope, discarding Dragondark; he Special Summoned the Jackalope and drew a card . He played the only card in his hand, Sekka’s Light, for two more draws. He activated Tsuchinoko from his hand, discarding itself… he conceded! Acepcion began the next Duel with Allure of Darkness, Jackalope, Fantastical Dragon Phantazmay, Mothman, and Wyverbuster. He played Allure of Darkness to draw Destrudo and another Wyverbuster, and banished Phantazmay. He activated Mothman, and discarding and Summoning it, and drew Orcust Cymbal Skeleton. He activated Jackalope next, discarding Cymbal Skeleton; he Special Summoned Jackalope and drew Mare Mare. He used Mothman and Jackalope to play Knightmare Phoenix, then that for Knightmare Mermaid. He discarded Destrudo for Mermaid’s effect to Special Summon Orcust Knightmare in Defense Position. He banished Mothman to play Wyverbuster, then used his two Knightmares to play Galatea, the Orcust Automaton. He banished Orcust Knightmare to boost his Wyverbuster, sending Orcust Harp Horror to the Graveyard. Then, Galatea returned Orcust Knightmare to the Deck. He used Harp Horror to bring Orcust Knightmare to the field once more, then used it and Galatea to play Summon Sorceress. He banished Cymbal Skeleton to revive Galatea, then Summon Sorceress brought forth World Legacy – “World Wand”! He used World Wand and Galatea to play The Phantom Knights of Rusty Bardiche, sending The Phantom Knights of Ancient Cloak to the Graveyard to Set The Phantom Knights of Shade Brigandine. He then banished Ancient Cloak to search for The Phantom Knights of Silent Boots, which he Summoned. Destrudo revived itself, and he used it with Wyverbuster to play Borreload Savage Dragon! It equipped Knightmare Phoenix with its effect and got two Borrel Counters, and Wyverbuster added Collapserpent to his hand. He used World Wand to Special Summon Harp Horror, activated Brigandine, and played Time Thief Redoer. Time Redoer attached Phantom Skyblaster to itself with its effect. 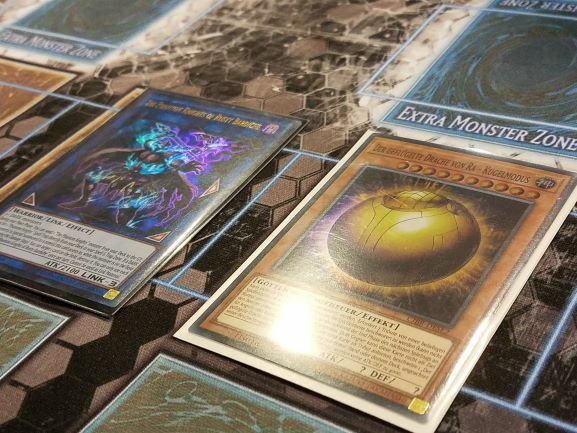 Furman was unphased as he obliterated Acepcion’s field with The Winged Dragon of Ra – Sphere Mode! He Tributed everything but the Rusty Bardiche. He flashed his hand, including some Danger! monsters and Sekka’s Light, and Acepcion conceded on the spot! Acepcion decided to play second. Furman began with Sekka’s Light, then Thunder Dragon for two more copies of itself. He used Sekka’s Light to shuffle a Sphere Mode into the Deck and draw a new card. He discarded Dragonhawk to Special Summon Thunder Dragon, then Tribute Summoned Dragonroar. He used that to play Thunder Dragon Colossus, and Dragonroar Special Summoned Dragondark. He Special Summoned Wyverbuster, banishing Dragonroar. Then, he used Colossus and Dragondark to play Reprodocus. Dragondark added Thunder Dragonduo to Furman’s hand. He used Reprodocus to turn Wyverbuster into a Dinosaur, using them both to play Summon Sorceress, and Wyverbuster added Collapserpent to his hand. He Special Summoned Dragonduo, banishing Wyverbuster and Colossus. With Summon Sorceress, he Special Summoned Dragondark. He Tributed Dragondark to play another Colossus, then Special Summoned Darkest Diabolos, Lord of the Lair. He Special Summoned Collapserpent and had Diabolos Tribute it to put Collapserpent from Acepcion’s hand under the Deck. Acepcion was thrilled, considering the rest of his hand. Acepcion had two Wyverbuster, Sekka’s Light, and Jizukiru, the Star Destroying Kaiju. He drew Dark Grepher. Sekka’s Light gave him Silent Boots and Tsuchinoko, then he used Sekka’s other effect to shuffle a Wyverbuster into the Deck and draw Jackalope. He Special Summoned his remaining Wyverbuster, Tributed Furman’s Colossus to hand over Jizukiru, then played Grepher. It discarded Jackalope to send Destrudo to the Graveyard, and Jackalope Special Summoned a Tsuchinoko. He used Grepher and Tsuchinoko to play Knightmare Cerberus, discarding Silent Boots to destroy Dragonduo, and Furman Special Summoned Fantastical Dragon Phantazmay! After that resolved, Acepcion used Cerberus to play Knightmare Mermaid, discarding Tuschinoko to play Orcust Knightmare. Tsuchinoko Special Summoned itself. He used Mermaid and Orcust Knightmare to play Galatea, then used Orcust Knightmare to send Harp Horror to the Graveyard and boost Wyverbuster. He banished Harp Horror to Special Summon Cymbal Skeleton. He used Silent Boots to search for Shade Brigandine, the activated Tsuchinoko in his hand, but discarded it (and could not use its effect in the Graveyard since had used a Tsuchinoko earlier in the turn). He used Galatea and Cymbal Skeleton to play Summon Sorceress, pointing to Wyverbuster, and the Sorceress brought Destrudo to the field. He used all his monsters to play Borrelsword Dragon! Wyverbuster added Collapserpent to his hand, and he Special Summoned it. He used Cymbal Skeleton to bring Galatea back, and revived Destrudo as well. He used those monsters to play Borreload Dragon! He went to the Battle Phase! Borreload Dragon attacked and took control of Jizukiru. Borrelsword attacked and wiped out Diabolos with its effect boosting its ATK. Borreload weakened Summon Sorceress, and Jizukiru destroyed it. Then Borrelsword switched Jizukiru to Defense Position so it could attack again. Borrelsword destroyed Fantastical Dragon Phantazmay. Furman Special Summoned Wyverbuster, banishing Dragondark, and Dragondark added Dragonhawk to his hand. He used it to Special Summon Dragonroar, then used Tsuchinoko. It discarded Sphere Mode and Special Summoned itself. He Tributed Dragonroar to play Thunder Dragon Colossus, then Special Summoned Diabolos. Dragonroar Special Summoned Dragondark. He used Wyverbuster and Dragondark to play Knightmare Phoenix, then he activated Jackalope in hand, discarding itself. It Special Summoned Nessie. He used Nessie, Tsuchinoko, and Phoenix to play Borreload Dragon! Borreload attacked and stole Acepcion’s Borreload, and that one swiped Borrelsword! Borrelsword wiped out Jizukiru and boosted its ATK. Diabolos and Colossus attacked as well, then Borrelsword used its effect to attack once more! Acepcion had nothing to defend himself with and offered the handshake! Aaron Furman is victorious with Danger! Thunder Dragons!